Online privacy is very hard to manage. You go shopping and the Online Seller holds your Address, Credit Card Number, Expiry Date, Date of Birth etc. You visit any of your favorite websites and the web-server stores (in most of the cases) information about you like IP Address, Browser information, OS, location details (yes, even GPS) etc. It’s very difficult to opt-out or stay away from these situations because in some cases this information is legally required by the other party. But what if some person is using your information without your consent or notice? For example sharing your private email address publicly or your phone number? OR your NTN/ID Card details? Previously, it was a nightmare to find out the source of leakage but now Google gives you the ability to manage exactly that very easily. Before using it I would suggest you do a little ego-surfing, i.e. search for your name or personal information on the internet. Now let’s come to the “Me on the Web Feature” provided by Google. 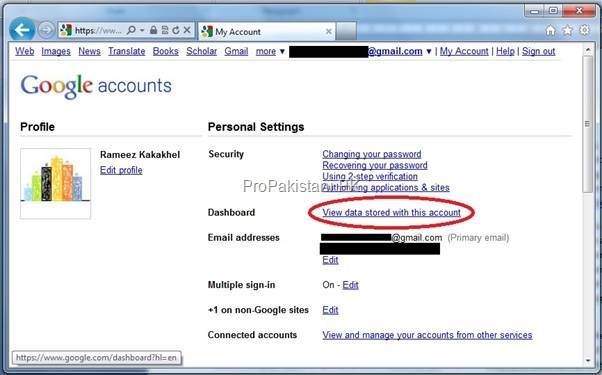 Go to: www.google.com.pk/accounts & login with your Gmail ID (create a new account if you don’t have one). Go to the “Me on the Web” section. 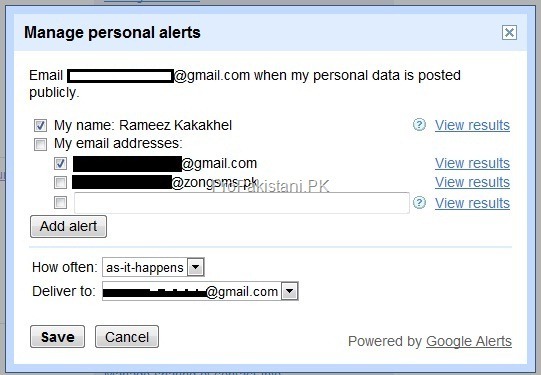 There click on ‘Set up search alerts for your data’. In the next section you get a few default options like Your Name & email addresses. Here you can add the details about which you want to be notified. Now whenever the name, email addresses, ID Card number & phone number are posted online I will be informed ‘as it happens’ through email specified in the ‘deliver to’ section. The ‘Me on the Web’ section also educates you about Privacy Issues and how to remove the information that you don’t want to be shared. cant you achieve this through google alerts? in simple way? It’s just Google Alerts, simplified, personalized in a separate section (making it easier for people like me) with Tips on improving privacy. Besides this the links you had in your Google profile also appear here. p.s. the section on ‘how to remove information’ is the most important one. 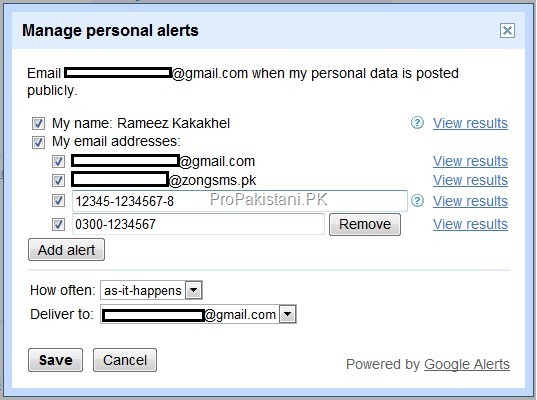 bhai plz help me meri GMail ki i.d open nahi ho rahi hay forgt pswd kerlia sub kuch ker k thak gaya hn per open nahi hoti yehi i.d or pswd face book ka bhi hay same per wo hojata hay open. First of all change your Facebook password ASAP. 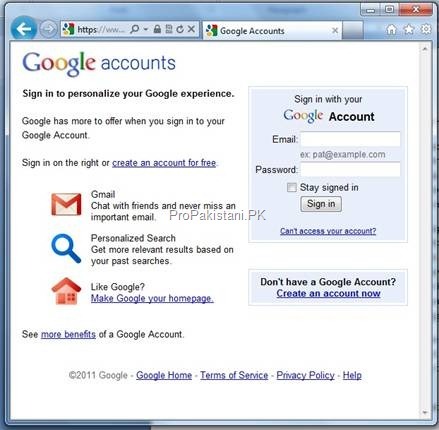 Secondly if the Forgot Password options by Google didn’t help you can’t do anything about it (mostly). Try removing the cookies+temporary files and try again. If you have made multiple tries to open your account than you may have to wait for a few hours before the account is re-activated (don’t remember the original time). I don’t need loan, i need mobile credit. You want your credit to move? This is also true that Google is secretly cooperating with CIA sharing information of their customers. I can share a video by German Educators (in English) on this.